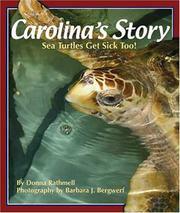 Children's Picture Book Database at Miami University | Carolina&#39;s story: Sea turtles get sick too! Carolina&#39;s story: Sea turtles get sick too! Follow the photo journal of Carolina, a critically ill loggerhead sea turtle, as she is cared for and nursed back to health at the Sea Turtle Hospital of the South Carolina Aquarium. \r\n\r\nJust like hospitalized children, Carolina goes through a variety of emotions and procedures during her care and recovery process. When she first arrives at the hospital, she is too sick, weak, and confused to understand what is happening. She has blood drawn, x-rays taken, gets shots, and is fed through an IV...just as ill children may be! As she gains strength, she begins to interact with her caregivers and begrudgingly, understands that they are really trying to help. Join her as she interacts with her many caregivers and her sick or injured roommate turtles. Rathmell, Donna, “Carolina&#39;s story: Sea turtles get sick too!,” Children's Picture Book Database at Miami University, accessed April 24, 2019, https://dlp.lib.miamioh.edu/picturebook/items/show/13279.